Hydroponics is a subset of hydroculture. Growing plants without soil are known as hydroponics.effective and potent method of growing your herbs and vegetables. How can someone think of growing plants without soil? Well, we got the answer for you. Our article is all about HYDROPONICS. In fact all about Hydroponics Herb Garden. The word “Hydroponics” means growing plants in water. i.e you can actually grow plants without using soil. Hydroponics is a system by which the plant’s roots are suspended in water while a nutrient can be pumped by it, promoting and optimizing healthy growth for your plants. NO soil required, a pollution free environment in which you can grow many plants including herbs, fruits, and vegetables all hydroponically without soil in less time with lots of social and health benefits in an eco-friendly environment. Is’nt it amazing! really it is. Our article will give you all information about hydroponics and related important topics which will be ideal for the beginners who love pollution free gardening at their home and also for the farmers who want to grow commercially profitable plants. With the effective hydroponic system, modern horticultural lighting has transformed our hobby and freed us to grow our favorite plants where and when we choose. Our website will provide the complete information by which you can easily grow eco-friendly Hydroponic Herb Garden. 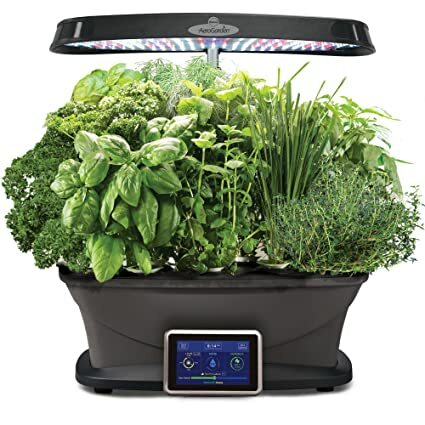 AeroGarden Ultra (LED) with Gourmet Herb Seed Pod Kit can be used with fresh herbs, vegetables, salad greens, flowers and more in this smart countertop garden. The garden capacity is Up to 7 plants that can be grown at a time. Plants are grown through the hydroponic system without soil. Advanced hydroponics techniques which handled easily. Full spectrum 30-watt LED lighting system is tuned to the specific spectrum that allows plants to maximize photosynthesis, resulting in rapid, natural growth and abundant harvests. Interactive LCD screen control panel exactly guides you about the water requirement, to add patented nutrients (included), automatically turns lights on and off and provides timely tips and on-screen help functions. 7-Pod Gourmet Herb Seed Kit that contains: Genovese Basil, Thai Basil, Thyme, Mint, Curly Parsley, Chives and Dill & 3 oz. patented nutrients (enough for a full season of growth). Enjoy a beautiful Garden all year around with AeroGarden Harvest Elite with Gourmet Herb Seed Pod Kit, Stainless Steel. Grow easily now fresh herbs, vegetables, salad greens, flowers and more in this smart countertop garden. With a beautiful stainless steel finish, it will definitely look great on your countertop. The capacity is Up to 6 plants can be grown at a time. Plants grow through advanced Hydroponics techniques. With High-performance, the kit contains full spectrum 20-watt LED lighting system which is tuned to the specific spectrum that allows plants to maximize photosynthesis, resulting in rapid, natural growth and abundant harvests. Easy to use control panel tells you when to add water, reminds you when to add patented nutrients (Included), automatically turns lights on and off. 6-Pod Gourmet Herb Seed Kit that contains: Genovese Basil, Curly Parsley, Dill, Thyme, Thai Basil and Mint & 3 oz. patented nutrients (enough for a full season of growth). 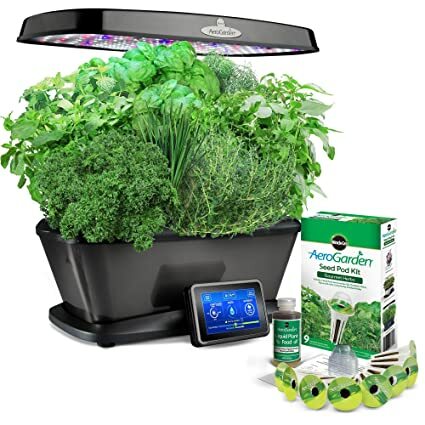 Enjoy beautiful Garden year ’round with AeroGarden Bounty with Gourmet Herb Seed Pod Kit by using this kit you can grow fresh herbs, vegetables, salad greens, flowers and more in this soil-free indoor gardening system that grows plants 5 times faster than soil. High-performance, full spectrum 45-watt LED lighting system. Our most powerful garden available with 50% more output. Fully interactive touch screen control panel tells you when to add water, reminds you when to add plant food, automatically turns lights on and off and provides timely tips and on-screen help functions. Our first ever 9-pod garden, with 24-inch extendable lamp arm for bigger yields & more variety and grow anything, including fresh herbs, salad greens, vegetables, flowers, and more. 9-Pod Gourmet Herb Seed Kit that contains: Genovese Basil (x2), Thai Basil, Curly Parsley, Italian Parsley, Thyme, Chives Dill, Mint & 3 oz. liquid plant food. 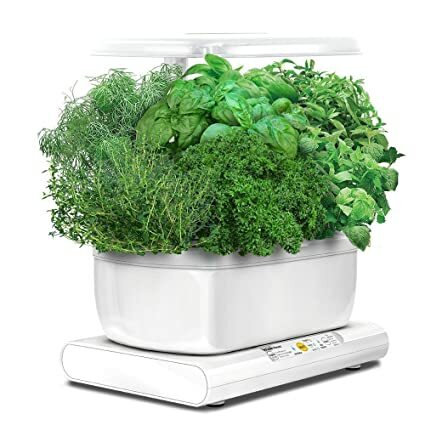 Enjoy the feel of the beautiful garden using AeroGarden Harvest with Gourmet Herb Seed Pod Kit, White, now Grow fresh herbs, vegetables, salad greens, flowers and more in this smart countertop garden. You can grow Up to 6 plants at a time. Plants are grown through the hydroponic system without soil. High-performance with full spectrum 20-watt LED lighting system is tuned to the specific spectrum that allows plants to maximize photosynthesis, resulting in rapid, natural growth and abundant harvests. LCD control panel indicates you when to add water and also reminds you when to add patented nutrients (Included), automatically turns lights on and off the system. 6-Pod Gourmet Herb Seed Kit contains Genovese Basil, Curly Parsley, Dill, Thyme, Thai Basil and Mint & 3 oz. patented nutrients (enough for a full season of growth). The AquaSprouts Garden is a self-sustaining aquarium & aquaponics kit suitable for the home, office or school settings. Fish fertilize the plants. Plants clean the water for the fish. Fits any standard 10-gallon aquarium. You can grow a variety of veggies, herbs, greens, and decorative plants all year long. Perfect tool to explore how it grows in our natural environmental settings. 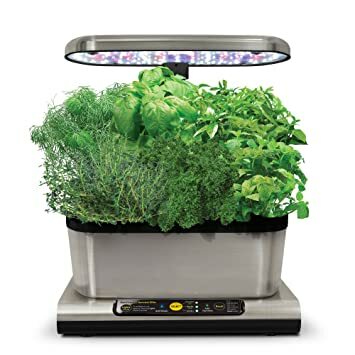 You can grow fresh herbs, vegetables, salad greens, flowers and more in this smart countertop garden by using AeroGarden Bounty Elite with Gourmet Herb Seed Pod Kit, Platinum and with a platinum stainless steel finish, it will look great on your countertop. Up to 9 plants can be grown at a time hydroponically without soil. High-performance and full spectrum 45-watt LED lighting system is tuned to the specific spectrum that allows plants to maximize photosynthesis, resulting in rapid, natural growth and abundant harvests. Fully interactive touch screen control panel gives an indication of water, reminds you when to add patented nutrients (included), automatically turns lights on and off and provides timely tips and on-screen help functions. The kit Includes 9-Pod Gourmet Herb Seed that contains: Genovese Basil (x2), Thai Basil, Curly Parsley, Italian Parsley, Thyme, Chives, Dill, Mint & 3 oz. patented nutrients (enough for a full season of growth). Best Hydroponic herbs to grow? Hydroponics herbs are very beneficial. You can grow a variety of hydroponic herbs which includes a large variety of flowers, vegetables, and other natural herbs. A large number of herbs will grow very well in a hydroponic setting. Some which grow best hydroponically include mint, oregano, parsley, rosemary, sage, tarragon, and thyme. basil, catnip, chamomile, chervil, chives, cilantro, coriander, dill, fennel, lavender etc. Basil can be grown hydroponically but in a protected environment, growing basil can be accomplished throughout the year. Once it matures, it can be easily harvested and trimmed weekly. It responds extremely well to hydroponic growing. Mint is usually grown on land, most mints are actually aquatic or semi-aquatic plants doing their best in shallow water at the edges of ponds and streams. Mint is used in dishes for flavoring. Spearmint, peppermint, and orange mint are three examples of mints that grow best in or close to water. Mint grown in water tends to have bigger, lusher foliage than land-grown mint, so it is ideal in hydroponic gardens. Cilantro is a parsley-type herb. When grown for leaves only, it is called cilantro but if allowed to continue growing to seed, it becomes what is called coriander. Coriander requires cool temperatures or it will bolt. Coriander grows best in full sun. Only the immature leaves are sold. (The mature “feathery” leaves that precede bolting are not desirable.) To grow in a slab, upon final harvest, pull out plants by the roots and re-seed directly into the slab, or transplant. Harvest by cutting tops to the crown and allowing to regrow pull up by the roots. Peppers, like tomatoes, prefer warm growing conditions. Most peppers plants also require staking. Many varieties to grow hydroponically include cubic, mazurka, Fellini, Nairobi and gold flame for sweet peppers and jalapeno, habanero, and cayenne for hot peppers. Peppers growing hydroponically grow as same as hydroponic tomatoes which require same light and temperature requirements. It is very interesting to know that tomatoes grow hydroponically. Hydroponic tomatoes can be achieved from transplants. Good cocktail or cherry tomato varieties for hydroponic growing are Cherita and Sweet 100s. To maintain the plant in an upright position, Hydroponic tomatoes require staking or other support systems. Tomatoes need flowing nutrient systems where the feeding solution moves past the roots on a schedule four to six times per day. For seedlings, set the temperatures between, 68 degrees and 72 degrees Fahrenheit. Lighting requires up to 18 rs for improved production. Tomatoes to grow hydroponically need daytime temperature 70-79 degrees Fahrenheit and nighttime temperature to 61-65 degrees Fahrenheit. Pollinate through vibration or gently shaking stems with blossoms. Oregano is another interesting and well-known herb which grows hydroponically, it is a hardy perennial that has sprawling stems that can grow to 2 feet tall. It has small pink or white flowers. Oregano can be propagated by seed or division. Try to Replant when plants become woody in 3 to 4 years. Leaves can be used fresh or preserved by drying. Oregano leaves are extensively used as a flavoring on pizza, salads or sprinkled over delicious dishes. It is best used in Italian-type sauces. The Wick system is one of the known hydroponic systems by which you can easily grow plants. It is often described as a passive system, by which we mean there are no moving parts. This system can use a variety of mediums like perlite. From the bottom reservoir, specific Growth Technology nutrient solution is drawn up through a number of wicks into the growing medium. Ebb and Flow System also are known as flood and drain is one of the hydroponic systems which works by temporarily flooding the grow tray. The system is very simple and easy to use. The nutrient solution available from a reservoir surrounds the roots before draining back. The system works automatically with a water pump on a timer. The N.F.T system is used to grow plants hydroponically. Nutrient Film Technique uses a constant flow of your Growth Technology nutrient solution. The solution is pumped from a reservoir into the growing tray. The growing tray requires no growing medium. The timer is also not fixed. The roots draw up the nutrients from the flowing solution. The downward flow pours back into the reservoir to be recycled again. In order to avoid system failures, proper pumping and electric maintenance are essential, It is to be taken care that the roots can dry out rapidly when the flow stops. Drip systems are most widely used the hydroponic method. The system works on a timer which controls a water pump, through a network of elevated water jets, the water, and the Growth Technology nutrient solutions are pumped. The excess nutrient solution is collected back into the reservoir through a recovery system. A non-recovery drip system will avoid this allowing the pH of the reservoir not to vary. You have to be careful with the recovery system and be sure to check the pH level of the reservoir regularly and adjust using either pH UP or pH Down solutions. This system is an active system with moving parts. As active hydroponic systems go, water culture system is the simplest. The roots of the plant are totally immersed in the water which contains the specific Growth Technology nutrient solutions. An air pump with help oxygenate the water and allow the roots to breathe. Hydroponics will change How you grow everything. Variety of plants are grown by using hydroponics. The hydroponically grown plants like herbs vegetables, fruits are beneficial for us especially when we concern about our health. Let’s have a look at some of the benefits of Hydroponic Herb Garden. If you are crazy about growing plants then you won’t much look into the cost but isn’t it worth if you really get to do this within your budget. Surprisingly growing plants hydroponically is not much costly. Think about the fresh herbs which you can cultivate without spending much. Nowadays people don’t have space to grow their favorite plants. Due to rapid development and industrialization, we don’t have space to cultivate. As a result, we are on the verge of taking adulterated food, fruits vegetables obtained from polluted plants. Finally which is deteriorating our health so badly. Hydroponics is a wonderful option and a perfect solution for it. You can now enjoy planting hydroponically at your own home and get all your favorite plants all year around. Hydroponic systems are appreciable especially when we really concern about protecting our environment. Plants growing hydroponically provides environmental benefits which can help reduce energy, expenditure, and waste. You can easily recycle the resources you need for your system which means that you can reuse water and unused nutrients which in turn saves your money, time, and energy. The herbs growing hydroponically can soak in the perfect amount of nutrients as they mix efficiently with water than soils. The soil is not required in hydroponics and the water contains maximum minerals. So, we can easily conclude that the pH level can be controlled by using hydroponics. Hydroponic gardens keep your plants free from soil-borne pests such as groundhogs, birds, and gophers. Hydroponics eliminate the use of soil which keeps your herbs away from ailments like Pythium, Fusarium as well as the Rhizoctonia species. Through indoor planting, you can easily take care of your plants. Hydroponics is one of the best options for all the beginners who are fond of gardening and also for those farmers who want to grow plants which can be best used commercially. Hydroponic plants are very beneficial as it saves your expenditure, time and energy. Start growing now plants hydroponically and keep your home in an eco-friendly environment. A fine Hydroponic system can produce a plant of good quality with fewer efforts and in less time. Hydroponics is the best and right choice for all types of growers. You just need to get the hang of the basics and all the working equipment. So, start slow and simple and grow best of the plants using Hydroponics.